If you want to change gear ratios in your Dana-44 axle, you may be able to reuse some of your old shims, but chances are you will not have enough. 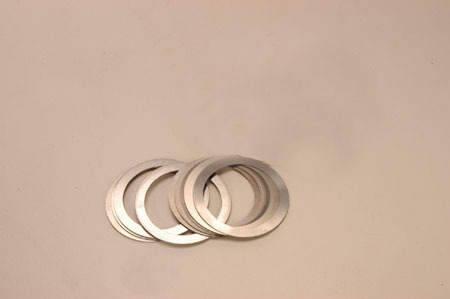 If you need some extras, then you can order this carrier bearing shim pack. This will fit all Dana-44 axles used in K, KB, L, R, S, A, B, C, and D-series, as well as Scout 800 and Scout II. This may also fit Metro (M-series). This will also fit all Dana-44 axles used by Jeep, Ford, Chevy, Dodge, Willys, Checker, and many others. See SP13653 for a kit with both the carrier and pinion shims, the pinion nut and washer, and cover gasket.